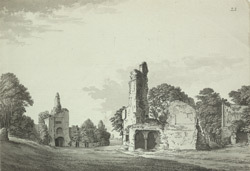 An interior view in ink of the ruins of the original 12th-century Sherborne Castle in Dorset. Sir Walter Raleigh fell in love with the building when he saw it in the 16th century, and persuaded Queen Elizabeth to have the Church relinquish it to the Crown. Raleigh was given a 99-year lease by Elizabeth and tried to modernise the castle, but eventually decided to construct a new building on the site of the old deer-hunting lodge in the castle grounds. Raleigh lived in his new house for little more than ten years before his execution for treason. In 1617, King James I allowed Sir John Digby to purchase the castle and estates, which remain in the family to this day.